It is the most important work of the Viennese architect of Serbian origin Konstantin A. Jovanović. The building was constructed in two phases: the first corner part against Cara Lazara Street was built in 1888-1889 and the annex in 1922-1925. This annexation is perceived primarily in the interior, because the main entrance originally was at the corner, and now it is in the middle of the building. A complete unity of the style based on neorenaissance was accomplished in the exterior. Richly decorated counter-hall is one of the most representative Belgrade interiors, and then young Belgrade painter Moša Pijade, later a politician and statesman, participated in illustrating the ceiling. The original corpus against the Trg republike, was built in 1902 according to the design of Andra Stevanović and Nikola Nestorović. The part facing Laza Paču Street was built in 1930, when the counter-hall (today the atrium of the National Museum) was arranged. In World War II the building was heavily damaged, and after the war it was rebuilt without the dome it has today. In the sixties, thanks to the efforts of then the manager of the National Museum, Dr. Lazar Trifunović, the central dome was back in place, and the interior arranged, so that today it fully serves its purpose. Built in 1869 according to the design of Aleksandar Bugarski, the most productive architect of Belgrade in the XIX century. The decision to construct a special building for the theatre was made by Knez Mihailo Obrenović. The building was a typical theatre building of the time and was particularly reminiscent of La Scala, Milan, with regard to its Renaissance conception and the decorative finish. Later reconstructions, completely changed the original appearance. The heavy reconstruction was made in 1986 when the theatre regained the 1922 look and an annex was built towards Braće Jugovića Street. Beside theatrical purposes, the hall has been used for charity balls and concerts during the XIX century. The Great Constitutional Assembly adopted the famous 1888 Constitution in this building. Based on the open competition design of 1938, by Branko Bon and Milan Grakalić, this building was finished in 1940 according to the designs by Miladin Prljević and engineer Đorđe Lazarević. For a long time it has been the highest building, and the dominating structure of modern architecture on the Belgrade ridge, as well as a reference point of the spatial composition along the whole Terazije - Slavija line. 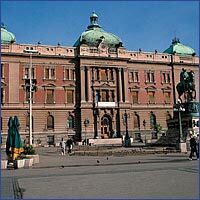 The first design for the House of the National Representation was made by Konstantin A. Jovanović in 1891. At the open competition of 1901 for the building on the area near the Batal mosque, the winning work was that of Jovan Ilkić, which is, in fact, a variant of Jovanović's solution. The construction of the palace began in 1907, and the cornerstone was laid by King Petar I. During World War I, Ilkić has died in the concentration camp in Nežider, while the plans have been lost. In accordance with the completed parts of the building, the new plans have been made by Ilkić's son Pavle, while Nikolaj Krasnov has helped in completion of the building, especially the interior. The construction was not finished until 1936. It was designed in the manner of academic traditionalism, with rich interior (architectural and artistic) decoration, made by, at that time, most famous artists and craftsmen. In 1939, a monumental sculptural group made by the famous sculptor Toma Rosandić was placed in front of the main entrance. It was named "Igrali se konji vrani" (Black horses are playing). The construction has lasted from 1969 until 1974. The project designer was Branko Pešić. The building was raised in the heart of old city center, stretching from Terazije to Slavija, with an emphasized aspiration to dominate with its high 24-storied part as the city's reference point. The first several stories are occupied by the "Beograd" department store, while on the other floors, there are business premises, as well as the head offices of several Belgrade media.